Voice actor Erik Bauersfeld - whose brief turn as Admiral Ackbar in the Star Wars films launched a pop culture catchphrase - has died, aged 93. 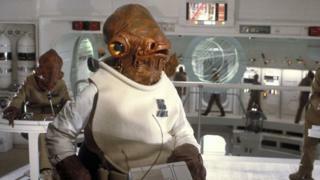 His line "It's a trap," in 1983's Return of the Jedi is beloved among Star Wars fans and later became a popular internet meme. The warning is being used as a hashtag on Twitter by fans paying tribute. Bauersfeld died on Sunday at his home in California, his manager told the Associated Press. Bauersfeld mainly worked in radio before his Star Wars roles. He also provided the voice for Jabba the Hutt's ghostly steward Bib Fortuna in Return of the Jedi. Admiral Ackbar and Bauersfeld returned for a cameo role in last year's Star Wars sequel The Force Awakens. Stormtroopers - the world's biggest army?